Match Dendrobium orchid care with its native habitat, and you'll set the path to dependable blooms. These spectacular orchids are among the most varied of any orchid genus -- in size, shape, and growing habit. And it's no wonder. More than 1,000 species exist, and their native habitats cover several continents, ranging from misty mountain forests to tropical highlands. Dendrobium is Latin meaning "living on trees" which accurately describes this genus. Nearly all are epiphytes in the wild, growing on trees where they anchor themselves with thick roots, although a few are lithophytic, perched on moss-covered rocks and cliffs. Clusters of lavish blooms come in every color of the rainbow...yellow, orange, red, pink, green (yes, green), blue, violet, lavender and white...in just about every possible combination. What most of them have in common is a contrasting throat color. And dendrobium flowers are deliciously fragrant. Some species have fat, stem-like pseudobulbs, although most have slender stems, called canes, that emerge from a rhizome. Don't cut off old canes that have dropped their leaves because they sometimes flower again. Shed some light. Put your orchids where they'll get plenty of light, but out of direct sun. If you don't have a spot near a window, grow lights work beautifully. Use 1 warm white tube and 1 cool white tube under a reflector. Place orchids about 8 inches (20 cm) beneath the light for 14-16 hours a day. It's also important to give them darkness at night. Orchids need a rest, too. Give them air. Orchids like free-flowing air as in their native habitats. Put them in a spot where they'll enjoy plenty of air circulation. Fans are fine, but keep them away from heat or AC vents. To repot...or not. Fir bark medium breaks down after a couple years and needs replaced. The best time to repot your orchid is when new growth begins, shortly after blooming. Got a reluctant bloomer? Give your orchid slightly cooler nighttime temperatures to spark blooming. A 15° difference will do. 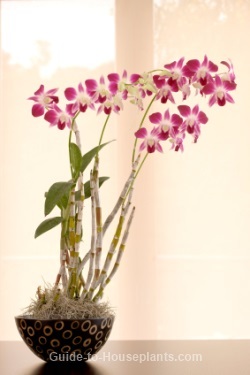 Dendrobiums will tolerate varying temperatures from 60° nights up to 90° days. They usually flower in spring, with some giving a second show of blooms in late summer. 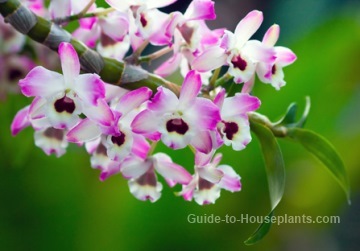 With good dendrobium orchid care, you can expect blooms year after year. 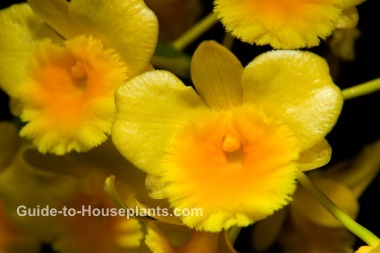 You'll find Dendrobium orchids for sale in the spring, when most are in bloom. However, their blooming time varies by species. D. chrysotoxum, shown above right, blooms from March to June. Height: Species vary widely -- many range from 6-30 in (15-75 cm). Taller orchids may need staking. Light: Bright indirect light year-round. Some direct morning sun is fine. Water: Water thoroughly and allow the top inch of soil to dry out between waterings. Dendrobiums store water in their rhizomes, and some species have water-storing pseudobulbs, making them more tolerant of dry soil than wet. Humidity: Moderate to high, preferably 50-70% humidity. If humidity drops below 50%, use a humidity tray or room humidifier to increase the moisture in the air. Grouping plants also helps to maintain the humidity around them. Temperature: 60-65°F/16-18°C nights and 75-80°F/24-27°C days. 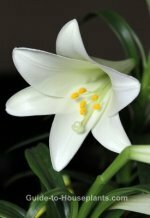 Cooler nighttime temps will help trigger blooming. 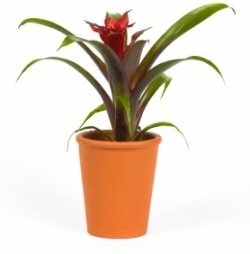 Fertilizer: Feed every 2 weeks with an orchid fertilizer while plant is growing and flowering.